I once had to explain to someone what, exactly, a stagehand was. I told her that I worked in theatres as a technician who put up sets and lighting for various stage productions. She was thinking that a "stagehand" was someone who rode stagecoaches holding a Winchester in their lap to guard against ambush while saying things like, "Aw, shucks, ma'am, t'weren't nuthin'..."
pi-rate (py'-reht) (fr. Lat. pirata, fr. Greek Peirates, fr. Peiran to attempt - more at fear) - N.
Often regarded as barbarous mercenaries, pirates are often found in large sailing ships of the Caribbean, most particularly in the port of Tortuga. Members of a pirate crew generally work on a deck, an area where heavy sails attached to a series of battens are held overhead by a network of carefully-designed rigging. Pirates are easily recognized by their beards, their numerous battle injuries, and their continual drinking of rum. Those who think a pirate's life is filled with leisure have never watched them work. A pirate's job requires nerves of steel and split-second timing. There is no margin for error in their work, no going back to correct a mistake; they know a single error on their part can be enough to crash the ship on the rocks. Accordingly, they have spent long years perfecting their skills. The typical pirate carries one or more deadly weapons at all times, and will not hesitate to use them. Pirates often begin as tradesmen, such as shipwrights or sailors. They often turn to careers in piracy because of the lure of easy money. Although often well-educated, pirates must serve apprenticeships lasting many years before being able to serve aboard a good ship. In spite of their formidable training and abilities, however, pirates are generally regarded as barbarous, treacherous, loathsome, backbiting, evil, twisted scum. They take some small measure of pride in this. For more information about pirates, we recommend reading Captain Blood by Rafael Sabatini. stage-hand (stayj-hãnd) (fr. Sax. estage, fr. (assumed) V.Lat. staticum to stand; + OE hand, akin to OHG hant hand) N.
Often regarded as barbarous mercenaries, stagehands are often found in large flagship theatres of the Northwest, most particularly in the port of Seattle. 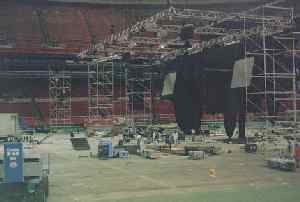 Members of a stagehand crew generally work on a deck, an area where heavy scenery attached to a series of battens is held overhead by a network of carefully-designed rigging. Stagehands are easily recognized by their beards, their numerous occupational injuries, and their continual drinking of triple mocha espressos. Those who think a stagehand's life is filled with leisure have never watched them work. A stagehand's job requires nerves of steel and split-second timing. There is no margin for error in their work, no going back to correct a mistake; they know a single error on their part can be enough to bring the production to a halt. Accordingly, they have spent long years perfecting their skills. The typical stagehand carries one or more college degrees at all times, and will not hesitate to use them. 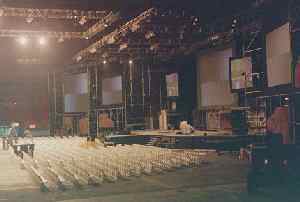 Stagehands often begin as tradesmen, such as carpenters or electricians. They often turn to careers in theatre in spite of the complete lack of easy money. Although often well-educated, stagehands must serve apprenticeships lasting many years before being able to get jobs where they can pay their rent. In spite of their formidable training and abilities, however, stagehands are generally regarded as barbarous, treacherous, loathsome, backbiting, evil, twisted scum. For more information about stagehands, we recommend reading Scene Design and Stage Lighting by Rafael Sabatini. Stagehands are often viewed as dangerous barbarians. I think we perpetuate the image because we've become so comfortable with it, and because it keeps people out of our way when we're trying to work. After you've had your initial prop check-in and you've learned that you don't have half your props yet and the preset lists you've been given are all being changed tomorrow morning but you have to be ready for the first onstage rehearsal at noon without fail and you don't know where the hell you're going to put your prop-boxes or where the actors need carpeting and equity-lights and you have no idea what the hell your cues are going to be, you may find there will be some small inclination towards panic. Stagehands have astonishing learning curves. It's not unusual for stage crews to have trucks full of unknown scenery arrive at a theatre on Monday, which we need to assemble and understand to open a show we've never seen before... on Tuesday night. Most people, if confronted with such a task, would flatly say it was impossible. Stagehands find ways to make it possible. We learn quickly, we draw upon years of experience, skills and training, and (all too often) we drink lots of coffee and work all night. Care to see what a stagehand's day can be like? I took some photos at a call I worked a few years back. It'll give you a rough idea of the scale of our work, even if it doesn't capture the subtlety of it. 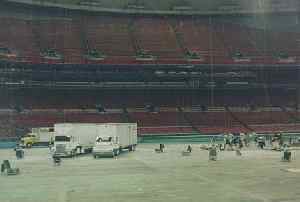 Left: The interior of Seattle's Kingdome, at an offensively early hour of the morning. 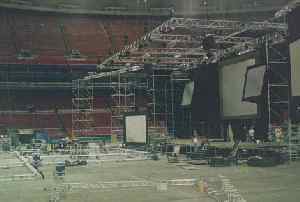 Left: With a basic framework of scaffolds and trusses completed, and forty-foot-long black curtains, lights, speakers, and the first video screens in the air, now's a good place to stop for lunch. Left: Focusing the lighting instruments. 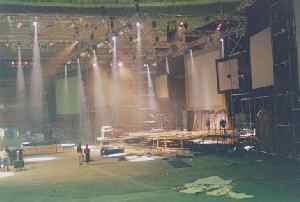 Right: With the vast array of scenic equipment in place and the extensive light, sound, and video equipment tested, the stage is nearly complete. Now all we have to do is run the actual show, tear the whole thing apart, and put it back into the trucks before we get to go home for the day. 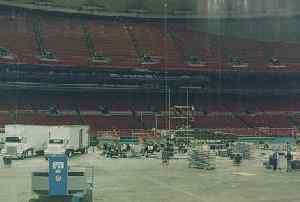 These photos, however, only show the work from a very broad perspective, and don't offer nearly enough of the stagehands' point of view. For example: The photos don't show the thought processes we go through to determine the safest way to install the scaffolds. You can see a few of the lights, but you can't see the hundreds of feet of cables we've run to get electrical power to them, or the computer-controlled dimmers which activate them, or the lens systems which we use to focus them. You can't see how heavy the deck is, nor can you hear the swearing we did when we found out the production company hadn't brought enough bolts to put all the equipment together. The work involved in focusing and fine-tuning the video projectors doesn't photograph terribly well, and the pressure of assembling all this with a show deadline looming inexorably ever-closer is impossible to convey. So the photos above may help somewhat, but they don't tell the full story. There's a staggering amount of technical information you accumulate as a stagehand. After you spend a few years at it you find you can answer questions about structural carpentry, electrical distribution, the mechanics of light, the mathematics of rigging, crew organization, production economics and safety factors from memory. This is to say nothing of being a full-time drama critic as well. Nonetheless, we continue to act like barbarians. A surprisingly high number of stagehands have college degrees. Most won't admit to them. Persuader: Hammer, usually a sledgehammer. Prop: Anything that gets in your way during a scene change. It's been said that stagehands are so adept at solving problems that, if given a year in charge of the government, they could get the entire country back on its feet and running smoothly by years' end. It has also been said, however, that nobody would ever agree to let a bunch of stagehands run the government. Goddammit: A mechanical error has just been discovered. When I applied for the job of prop-master at the Seattle Repertory Theatre, I added to my resumè: "Hates telephones." They hired me anyway, and I refused to answer the crew-room telephone for the next three and a half years. I enjoy silent movies. Recently I had a chance to re-watch the original "Phantom of the Opera", starring Lon Chaney. I hadn't seen it in long years, but watching it this time I was struck by the way the opera's stage crew was portrayed: they were aware of the Phantom's evil from the beginning, they knew more about him than anyone except the Secret Police, and in the end it was the stagehands who took matters into their own hands and destroyed the evil of the Phantom. Not a bad portrayal, all in all. "Hey, get out of my way, pally. I'm workin' here." I've had one longstanding handicap in my career as a stagehand. I don't drink coffee. I had communication problems with a woman I used to date. She was an artist, and as such had a strong belief in the importance and significance of appearances. I'm a stagehand, and as such have little faith in appearances since I work in an industry which manufactures fake ones every day. A very old stagehand named Bill Jensen once told me that stagework was "90% common sense". The problem is, he never taught me what the other 10% was. Excitement! Lights! Glamour! Yeah, right. What are ya, new?